"A program aimed at educating and empowering young women in Geraldton is building on a unique partnership to diversify its funding base. Shine, which encourages young women to stay in school and pursue careers, is working with Iluka Resources in a bud to connect with new sponsors and supporters. The girls involved in the program undertake hair dressing and beauty therapy classes to further their skills beyond school. 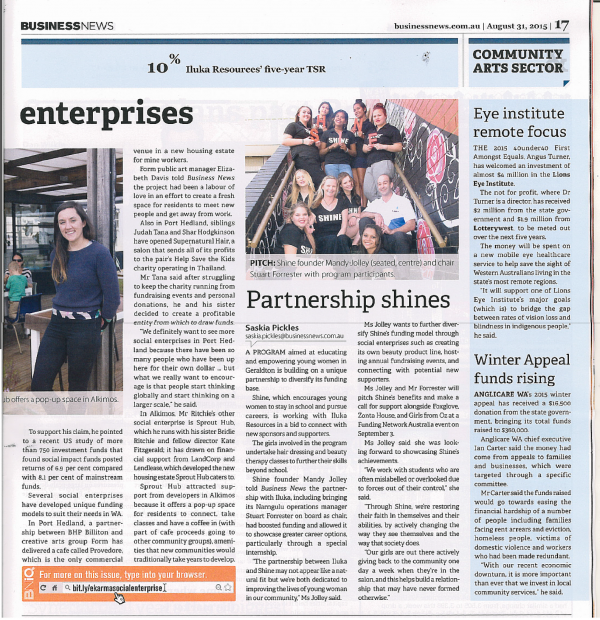 Shine founder Mandy Jolley told Business News the partnership with Iluka, including bringing its Narngulu operations manager Stuart Forresteron borad as chair, had boosted funding and allowed it to showcase greater career options, particularly through a special internship. “The partnership between Iluka and Shine may not appear like a natural fit but we’re both dedicated to improving the lives of young women in our community”. Ms Jolley said. Ms Jolley wants to further diversify Shine’s funding model through social enterprises such as creating its own beauty product line, hosting annual fundraising events, and connecting with potential new supporters. Ms Jolley and Mr Forrester will pitch Shine’s benefits and make a call for support alongside Foxglove, Zonta House, and Girls from Oz at a Funding Network Australia event on September 3. Ms Jolley said she was looking forward to showcasing Shine’s achievements. “We work with students who are often mislabeled or overlooked due to forces out of their control.” She said. “Through Shine, we’re restoring their faith in themselves and their abilities, by actively changing the way they see themselves and the way that society does. “Our girls are out there actively giving back to the community one day a week when they’re in the salon, and this helps build a relationship that may have never formed otherwise.”"
This article was written by Saskia Pickles, and was published in the WA Business News on August 31, 2015. Read the original here.